Unfortunately, we did not have any school groups joining us today but that gave us some time to really put the trowel to the dirt! We discovered our first feature, an artifact that can not be removed. The feature consisted of a small, reddish stain on the floor of one of our units. It has not been determined as to what it might be, so we opened another 1-meter by 1-meter unit right next to it to continue to explore our feature. 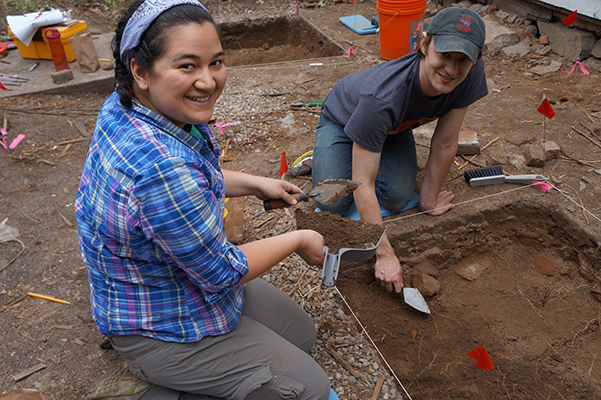 In the afternoon, we had three wonderful volunteers helping us with the digging, screening, and cleaning of artifacts. Thanks volunteers for your unbelievable help! 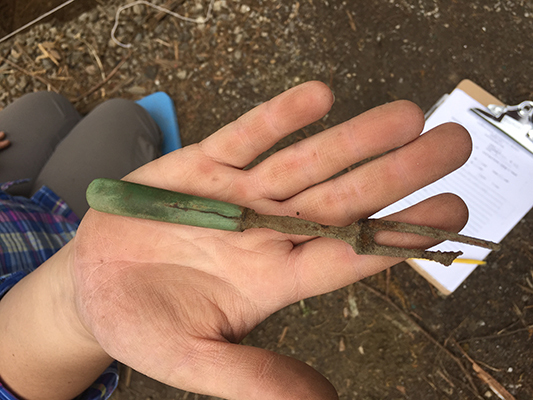 In addition to the feature, we found some spectacular artifacts including buttons, a bone-handled fork, some black cloth, and many pieces of animal bones. We can’t wait to see what we might find tomorrow! Elena holding the fork found in unit Y14. Elena and our volunteer, Nate, working on unit Y17. Can you see the brick starting to appear in the southeastern portion? I love seeing the artifacts! This is such a cool project!